Hello readers! Have you checked out my intro post yet? If you have, you’d know that I’m a commuter here at The College of Saint Rose. My situation is kind of unique, though. I stay with a couple friends at their apartment in Albany during the week. 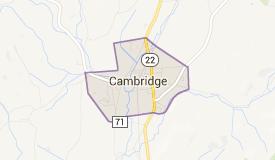 On Friday nights or Saturday mornings, I drive a good 40 miles north of Albany to a tiny country town called Cambridge, NY. Life in Cambridge is quiet and simple. I live there with my little brother, Nicholas, my mom, Audrey, her boyfriend, Jimmy, and his two boys, Andrew and Michael, not to mention our dogs Savannah and Ben. Savannah’s a red-nosed pit bull and is the most loving and energetic dog I’ve ever seen! She was raised by my mom’s boyfriend, Jimmy. Ben’s a 200 lb. mound of long brown and white fur and slobber, also known as a Saint Bernard. My family got him from a breeder as soon as he could leave the mother. I had to have been 11 or 12 at the time! We rent a house at the top of a hill off in the outskirts of town. We just moved there a little over a year ago. Before that we lived in a bigger small town called Greenwich, about 10 miles northwest of Cambridge. This is the town where I did most of my growing-up. We moved their just before we got Ben as a puppy. I love that little piece of nowhere. While it’s dull and has minimal entertainment options, it’s quaint and relaxing; it’s away from the hustle and busyness of Albany. While I love getting to see my family when I’m home, I have another reason for driving all that way every weekend: work. I have a job at a convenience store in Greenwich. It’s not the worst job out there but it’s certainly nothing glamorous. That luckily only occupies 8 to 12 hours of my weekend, so I get to see my friends regularly! I’m often at one friend’s place in particular, my man Bmo! His real name is Brandon, but…he’s Bmo. At the end of these weekends out in the country, I load up my car and make the trek back to Albany for another week of classes. This cycle is rather interesting to me due to it being a recent change in my life. My past two years of college were spent living on campus, first in Brubacher freshman year, then Lourdes hall last year. Getting to see family and friends back home on a regular basis is really nice, but being off campus separates me from all the other amazing friends I’ve made during my time at Saint Rose! It’s been hard keeping in contact with them all the way I used to. It’s a strange transition but I think I’m getting a handle on it. The fall semester was a learning experience in and outside of classes. Now I need to take what I’ve learned from my first semester “commuting” and find a better balance between all my classwork, my multiple paid jobs, and my once highly active social life! Wish me luck!